Mahindra USA Tractors, located in Texas and Atlanta, is the 3rd largest tractor companies in the world with sales of nearly 85,000 units annually in 10 countries. 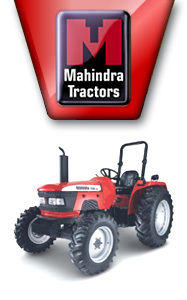 In India, the largest tractor market in the world, Mahindra has been the number one selling brand since 1983. In 1994, the company entered the American market as Mahindra USA, and in the few years since, its tough, dependable tractors are being sold and serviced by hundreds of leading tractor dealers throughout the country. From army vehicles to farm tractors to major automobile manufacturing, Mahindra's relationship with American industry goes back quite a few years. Mahindra was selected to assemble the famous Willys Jeep for American GIs serving in India in Word War II. Read more about their goals in their recently published Business Week article or visit their website at www.MahindraUSA.com. Business Week: Baseball, Apple Pie... and Mahindra? Engineers from India design advanced jet engines, write some of the world's most sophisticated software, and run massive global computer networks. But can they make a pickup truck that will sell in America's heartland? Mahindra & Mahindra, a conglomerate based in Mumbai, intends to find out. In spring, 2009, the company plans to launch two- and four-door pickups and a sport-utility vehicle in the U.S. This trio of diesel-powered trucks will compete against a big pack of aggressively promoted offerings from General Motors (GM), Ford (F), Dodge, Nissan (NSANY), and Toyota (TM). All of these manufacturers have been warring over a domestic pickup market that is shrinking and a SUV market that's overcrowded. Skepticism abounds. Trucks in the U.S. are sold with imagery of waving flags, macho companionship, and brawny workers showing off feats of towing strength to the sound of John Mellencamp anthems. Buyers tend to be loyal, practical traditionalists. Considering that established players such as Toyota, Nissan, and Honda have already had their share of trouble attracting this crowd, some experts wonder whether a little-known company from a country that has no history of selling vehicles to American consumers has a prayer. They're also skeptical that buyers will flock to diesel-a technology that many U.S. consumers associate with belching big rigs. "It looks like an impossible marketing play," says auto industry consultant Dan Gorrell of AutoStrategem in Tustin, Calif. But at a time of soaring gas prices, Mahindra's vehicles are going to have one big thing in their favor: superior fuel economy. Despite diesel's historic brown image, it is emerging as a green technology. New low-sulfur fuel, federally mandated in 2006, can produce mileage figures that nearly equal those of more fashionable hybrids. Mahindra estimates that its compact SUV, the Scorpio, and pickups, one of which will be called the Appalachian, will get about 30 miles per gallon in the city and as much as 37 on the highway. That compares with 30 city/34 highway for the $27,000 Ford Escape SUV hybrid and 21 city/27 highway for the gas-powered $23,000 Toyota RAV4. Although Mahindra is unknown to most American consumers, the company has made cars in India for more than 50 years. The $4.5 billion company also has financial services, information technology, telecommunications, and agricultural equipment businesses. Over the past decade, it has sold more than 50,000 tractors in the U.S.
Well aware of the image problems confronting an Indian pickup, Mahindra has conducted extensive consumer research in America. At a recent meeting at the Alpharetta (Ga.) offices of Global Vehicles, the company that will distribute the brand in the U.S., interviews with potential buyers were projected on a big screen. "I don't see them [Mahindra] entering the market and immediately competing with more established brands," said one thirtysomething male. "Can it really be made well if it comes from India?" asked another. Given these attitudes, the company has made a key strategic decision: It is not going to waste energy trying to persuade the unpersuadables. Instead, Mahindra is going to target the three groups it believes will be the most receptive to its vehicles-consumers who identify themselves as "green," people who have bought Mahindra tractors, and the close to 3 million Indian expatriate households in the U.S. The plan is to generate buzz with these buyers, then hope the word spreads to the mainstream. Rather than unrolling a big image-building marketing campaign, which would be drowned out by the thunder of other truck promotions, Mahindra plans to start small. It will spend only about $20 million on marketing in 2009, less than 10% of what Toyota spent to launch the Tundra pickup. Almost none of this money is expected to be devoted to television or glossy print ads. Instead, it will purchase carefully selected search terms and banner ads on Web sites popular with its target consumers. These links will steer potential buyers to detailed information about Mahindra's trucks. The green consumers whom the company is courting relentlessly research the products they buy, then frequently promote them to friends. Mahindra has set modest sales targets for its American operation. In the second six months of 2009, it plans to sell just 18,000 vehicles, followed by 45,000 in 2010. Mahindra will ship its SUV whole from India, but the pickup trucks will be transported in pieces. They will be assembled at one of three plant sites Global is scouting in the Southeast. Worried that any quality problems could quickly stigmatize the Mahindra brand, Global Vehicles CEO John A. Perez is working hard with Mahindra to keep the number of defects to a minimum. "We don't want to be Kia or Hyundai and have to apologize after we launch," says Perez. So far, Perez has attracted 263 dealers to distribute Mahindra trucks. One of them is Steven Taylor, a Cadillac dealer who's invested more than $1 million in a Mahindra franchise in Toledo despite all of the obvious risks. "Trucks and an SUV that get over 30 mpg is a market niche that will get noticed," Taylor says. Mahindra & Mahindra is 63 years old and entered the car business in 1949 by building Willys Jeeps in India. Today it's the leading maker of SUVs in the country. The privately held company is still controlled by the Mahindra family. In an interview with Business India, Vice-Chairman Anand G. Mahindra said of his global truck and SUV strategy: "We want to be the next Land Rover."